Golf Tough is an original and inspiring book– a golf psychology book that will transform your game. Dan Abrahams is Lead Psychologist for England Golf, as well as a former touring professional golfer, and PGA coach. 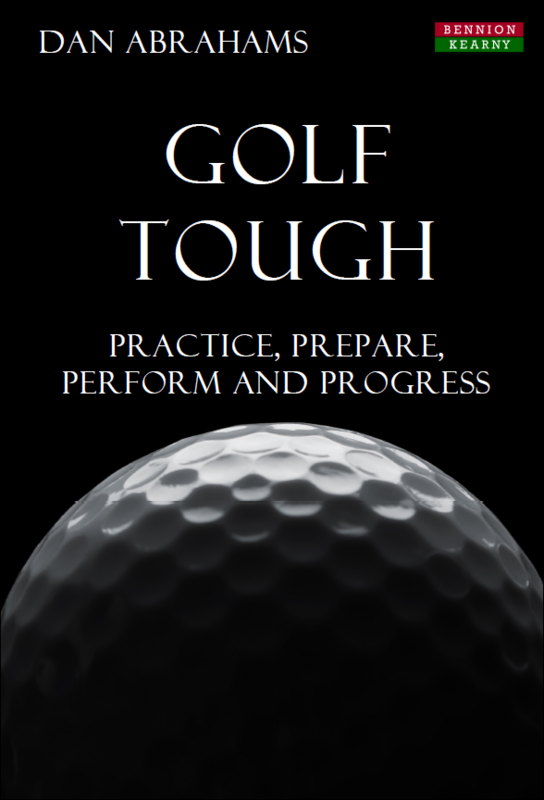 In Golf Tough, Dan offers you a powerful blueprint for improvement and a detailed plan for consistent high performance no matter what your standard of play. If you want to significantly lower your handicap, compete with greater consistency, win tournaments or reach the next level on the course, Dan’s simple yet powerful philosophies, tools and techniques will help you break through your current barriers and reach your golfing goals. Dan is renowned in the sporting world for pulling no punches and in Golf Tough he introduces the reader to a different approach to golf. This book will show you how to practice to build skill, technique and confidence – your visits to the range will become more productive and purposeful than ever, and your practice more deliberate. Dan also reveals the secret processes golfing champions employ to prepare to compete under the most intense pressure, as well as how all golfers can learn to stand on the first tee brimming with self-belief. Dan believes all golfers can learn to take control on the course – in Golf Tough he shows you how. Taking a unique viewpoint on performance and progression, you will learn from some of the top authorities in the game – the world’s leading golf statistician, one of the premier coaches in Europe, a putting coach to the stars, and a former caddy who spends his days teaching players to plot their way around the course. This accumulated wisdom, combined with Dan’s cutting edge approach in sport psychology – and with up-to-date scientific research, practical lessons, and eye opening anecdotes from golf and a variety of sports – makes Golf Tough the essential golfing read. Chapter 1 – A Numbers Game. Get to know the numbers behind your game. Hard data – rather than short term memory – will provide a platform for a practice structure that takes your game forwards. Chapter 2 – Becoming Skilful. Explore the importance of skills tests and understand the difference between skill and technique. Dan’s message is simple – if you want to shoot a low score develop your skill not just your technique! Chapter 3 – Tuning Your Golf Engine. Discover how we best learn from golf psychology to improve your technique and tap into the plasticity of the brain. Chapter 4 – Finding Your Game Face. Learn a strength based, solution oriented approach that delivers consistency time and again. Want to know how the best sports competitors compete under pressure? This chapter will teach you how. Chapter 5 – Plotting Your Course. Enjoy a round with one of the world’s leading course strategists. Get to know your risks, grade them, and knock shots off every round. Chapter 6 – Your Brain’s Routine. A chapter that finally explains why a shot routine is so important – to manage the quirks of your brain. Learn how to make effective decisions, build focus and confidence for every shot and manage your mindset once the ball has gone. Chapter 7 – Preparing to Win. Introducing you to the strange truth that all champions, no matter their sport, win by ignoring winning. Chapter 8 – Your First Controller. Understand the mind-body link, and the power of body language to create a golf psychology controller that manages your golf game. Chapter 9 – Your Second Controller. As many champion sportsmen and women have found – self-talk is a key ingredient to sporting success. Develop your self-talk controller to manage pressure and play with freedom and confidence. Chapter 10 – ANA and The Ants. Understand why unexpected and unwanted thoughts and images constantly seek your attention, and how Automatic Negative Thoughts can play havoc with your focus. Learn how to squash those ANTs! Chapter 11 – Progressing with Pinpoint Putting. Improve your putting with advice from one of the world’s top putting experts. Take time in his putting lab to dispel the myths of putting and learn how to get better – fast! Chapter 12 – The Mindset of Genius George. Follow the story of the billiards supremo Genius George Gray and learn how your golf ‘story’ – your inner dialogue about your game – can be directed to help you get the most from your ability. Chapter 13 – The Secret of Negative Thinking. Negative Thinking, when controlled and used properly, can serve as a powerful motivator and mediator. Mental Toughness is not about banishing negativity; it is about using Negative Thoughts to galvanize and expand your golfing performance. Chapter 14 – The 4 P’s of Billy Mills. The Unknown American – Billy Mills – has an amazing story. Learn how his tale of triumph encapsulated the 4P’s of Golf Tough: Practice, Prepare, Perform and Progress. Who this Book is for. Any and All Golfers, irrespective of age, ability or experience, who want to shoot lower scores, and compete to the very best of their abilities. Dan Abrahams is Lead Psychologist for England Golf, as well as a former touring professional golfer and PGA golf coach. He has delivered golf psychology wisdom to players globally at all levels – from amateur through to tour professional golfers, and he has previously been a lecturer for the British PGA and a county coach in England. He is a registered psychologist who has a built up a global reputation for his work in two sports – golf and soccer. His passion is to de-mystify golf psychology and deliver simple and practical ideas for players and coaches to implement on and off the course and the pitch. He is a regular speaker at playing, coaching and psychology conferences across Europe wowing audiences with his engaging, upbeat, positive and fun presentations and workshops. Book Categories: Dan Abrahams, Golf and Sport Psychology.